If Ellen DeGeneres mentions the film The Secret Life Of Walter Mitty on Sunday night, it might be with a wince — this year’s host of the Academy Awards was publicly shamed last month when her watermarked copy of Walter Mitty was leaked online. The Walter Mitty leak might make DeGeneres a cautionary tale about keeping track of your DVDs, but it’s just the tip of the iceberg that is Hollywood screener culture, which for years helped fuel movie piracy. That is, until recently. You don’t have to fill out an Oscar ballot to get free movies, though: While members of the Academy of Motion Picture Arts and Sciences (AMPAS) vote on the Oscars, organizations like the Screen Actors Guild, the Writer’s Guild of America and others have their own award ceremonies. While it might not be as prestigious to win Best Actor at the SAG Awards as it is to win an Oscar, these smaller ceremonies are still considered stepping-stones to the big prizes, and thus those voting bodies also receive screeners. 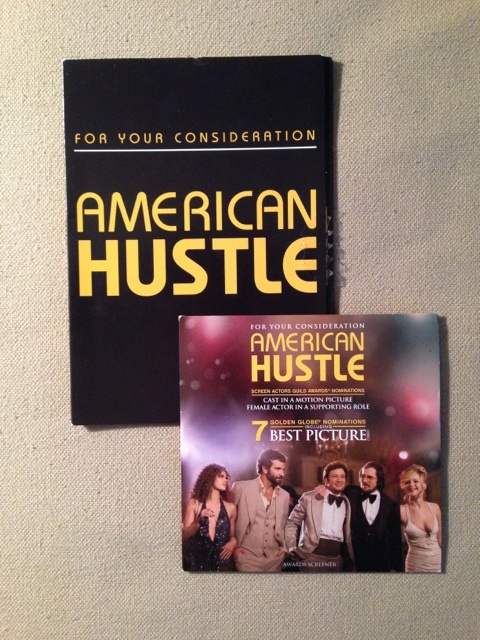 Screeners of “American Hustle” for PGA members (top) and SAG members (bottom). As you might predict from a situation where high-quality versions of high-profile films are suddenly available en masse, piracy is a major concern. But here’s the twist — over the past four years, screener piracy has actually decreased. For the 12th year running, Andy Baio of Waxy.org has tracked the piracy of award-nominated films with a detailed Google spreadsheet. According to Baio’s numbers, in 2003, 25 screeners of the 28 films nominated that year were leaked online. But in 2014, only 15 screeners of the 33 films nominated have been leaked. That’s less than half. To figure out why that might be, I spoke to several screener-receivers (under the condition of anonymity) about why that change has come about. First, some felt that the studios and guilds have succeeded, to some extent, in putting fear into the hearts of the membership. Screeners contain warnings, right at the very beginning of the DVD, that they are for guild-members-eyes-only, and that if they’re leaked, there will be consequences. There’s also a demand that the DVDs should be destroyed once viewed — nobody I spoke with said they had ever destroyed a physical screener. No one was certain as to what the exact punishment for leaking a screener would be, but their worries included being blacklisted by the leaked film’s studio and getting into serious trouble with their guilds. 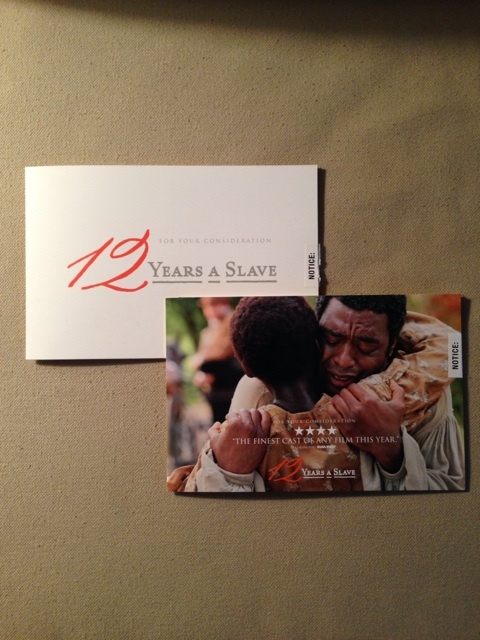 Screeners of “12 Years A Slave” for PGA members (top) and SAG members (bottom). There was mention of more than one Hollywood production company that has created a checkout system to track who borrows which screeners — not only bringing order to the lending process, but accountability as well, should a leak occur. In fact, none of the people I spoke to indicated that they’d ever have any interest in pirating their screeners — or that they thought their fellow guild members might do such a thing. A postal worker, one of her employees, friend, family member, or countless others in the production and distribution chain could be responsible for ripping the DVD and putting it online. How to combat that carelessness? Limit the opportunity for it to occur. Studios are now more selective about which guilds and organizations receive which screeners — and what format they receive them in. The consensus among those I spoke with was that watermarking DVDs for the AMPAS membership of 6,000 would be manageable, but doing the same for the SAG voting body of 160,000 people would be more difficult — and expensive. So, in 2011 some members of SAG — which currently has a membership of over 160,000 people — began receiving digital screeners in lieu of physical screeners. This year, at least four films were available to SAG members through an encoded iTunes (s AAPL) download that would expire after 30 days. Some also received DVDs — some in fact received duplicates, because the system appears to have some randomness to it — but members were able to download movies including the Judi Dench-starring Philomena for their consideration. Piracy will always be an issue when it comes to digital distribution. But perhaps, in this case, it’s technology that will solve the problems technology has created. This post was updated to correct a typo at 9:24am. Photo courtesy of Instagram user @drewpbaldwin. are that the movies these days are rubbish. Thank goodness people are taking the threat of piracy seriously. Funny how you take the data out of context to make a point. There are all kinds of releases and sometimes a better copy than a screener is out before the screeners are sent out for the Oscars. The timing of the theatrical release is also very relevant. In the end the absence of screeners from the chain of releases has no real impact on piracy. The studios are just being paranoid fools and you are applauding them…. The pirates are just being selfish jerks and you are applauding them….